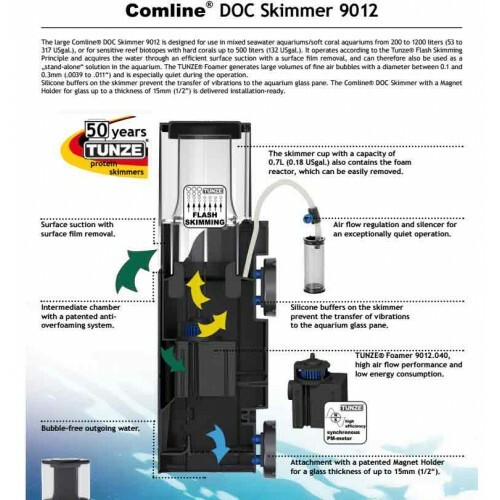 The Comline® DOC Skimmer 9012 is one of (if not the) first true “surface skimming” protein skimmers ever designed (check out its little brother Comline® DOC 9004). Think about it; the reason most of us go through all the hassle and expense with a sump/pumps/overflow box, fittings, lines etc is to get the protein-rich surface layer on top of the tank to the skimmer, right? 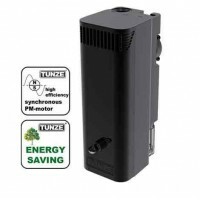 At Aquatic Warehouse, we have loaded up a 37gallon soft coral reef tank, whereas we cannot stuff in another coral, and it is a stunning reef tank with only the Tunze 9004, a Tunze 9062 filter and a small powerhead (and heater). The Comline® DOC 9012 Protein Skimmer is designed for use in saltwater up to a whopping 315 gallons (lightly loaded) or 180 gallon heavily loaded reef. 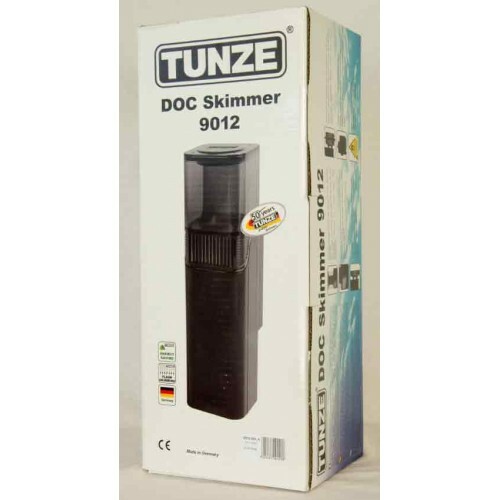 It operates according to the Tunze® “Flash Skimming Principle” and acquires the water through an efficient surface suction with a surface film removal. 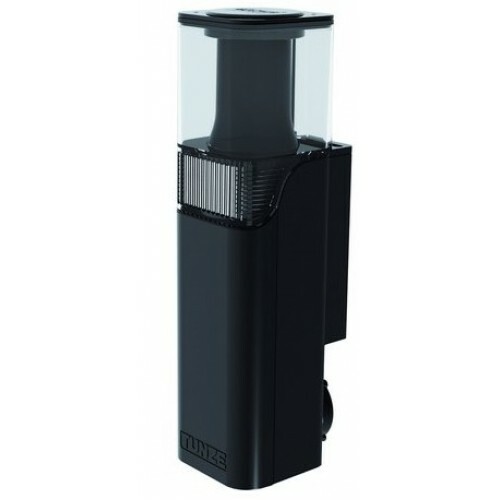 The TUNZE® Foamer generates large volumes of fine air bubbles and is especially quiet during operation. The “Flash skimming” principle enables highly efficient foam production. Organic-rich surface water is mixed thoroughly with small air bubbles in the TUNZE® Foamer. 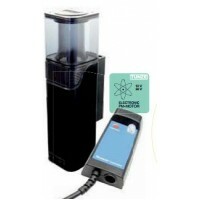 On the top surface of the air bubbles, pollutants such as protein, cellulose, dead cells, etc. are absorbed immediately. The water/air mixture expands and stabilizes in the skimmer cup reactor, the water returns to the aquarium, and the protein-loaded air bubbles spill over into the skimmer cup. 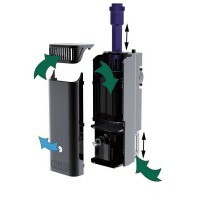 The patented anti-over foaming system intermediate chamber prevents the skimmer from over-foaming and controls the skimmer performance, depending on the water level and organic load. The particularly high efficiency of the “flash skimming” principle, compared to large skimmers with long contact time, is obtained because the substances absorbed by the air bubbles are not released again, thus they don‘t return to the aquarium water. A true surface skimming skimmer! Takes the place of needing a sump. Uses only a messily 13 Watts! !